Being an auto enthusiast, you would have come across different motorshows and auto-expos happening in India. For the very first time, India will be hosting the International Electric Vehicle Expo. Nitin Gadkari, Union Minister for Road Transport & Highways is going to inaugurate the first ever electric vehicle show and green mobility exposition in India. The event EVEXPO-2015 would kick-start on 24th December, 3.30 pm, Pragati Maidan, New Delhi. 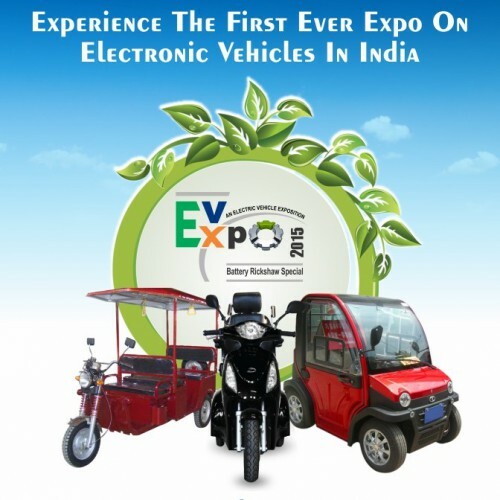 This first EV-Expo 2015 holds special significance particularly because this Expo is the first ever concerted effort put together after the passing of Motor Vehicles (Amendment Bill, 2015) bringing E-Carts & E-Rickshaws under the ambit of Motor Vehicles Act, 1988 specially at a time when Govt. is all out to promote E-Rickshaws & E-Carts to provide “End mile connectivity and ‘environment friendly’ transport solutions in order to boost passenger safety, convenience and in making India a pollution free country. Equally important is the fact that the Expo is in line with Govt.’s objective to convert 10% of 2/3/4 wheeler vehicles plying on the Indian roads into Hybrid/ E-Vehicles which makes E-Rickshaws & E-Carts hold special significance in creating a pollution free environment. This 4-day international exposition which is going to be held at Pragati Maidan, New Delhi from December 24 to December 27, 2015 would showcase the latest technological advancements in environment friendly electric vehicle, component, services and products for the transportation of passengers as wll as goods. EV-Expo 2015 shall witness participation from 100 + India & International E-Vehicle companies. Over 500 + high level business delegations from China, Germany, Sweden, Japan and other countries have confirmed their visit to EV-Expo. China has the highest number with over 22 Chinese companies showcasing their E-Vehicle products. Chinese is also sending 500+ high level Ministerial & Business delegation headed by the County Mayor Mr Shan Chanfeng to explore the market potential of E-vehicles in India. said Mr Anuj Sharma, Chairman, E-Rickshaw Committee, Ministry of Road Transport & Highways. Keeping in view of the important role that e-Rickshaws could play in environment friendly city transportation system, led by Shri Nitin Gadkari, the Government via an ordinance on Motor Vehicles Act, 1988 had also relaxed the norm for getting driving license for e-Rickshaws. The event comes at a time when country is looking at a paradigm shift in the way cities residents commute with a view to bring down dangerous level of transport related pollution level and also to bring down cost of intra-city commuting. It also comes as a corollary to “The National Electric Mobility Mission Plan 2020” plan announced in July 2015 to bring about transformational paradigm shift in the automotive and transportation industry in the country. Find more information on EV EXPO 2015 here. We look forward to be in the EV EXPO 2015 event and bring all the important updates to you..